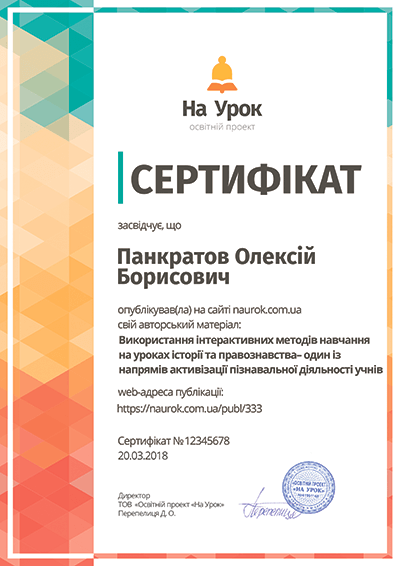 PPT презентація може бути використана під час вивчення теми "Стилі написання листів". 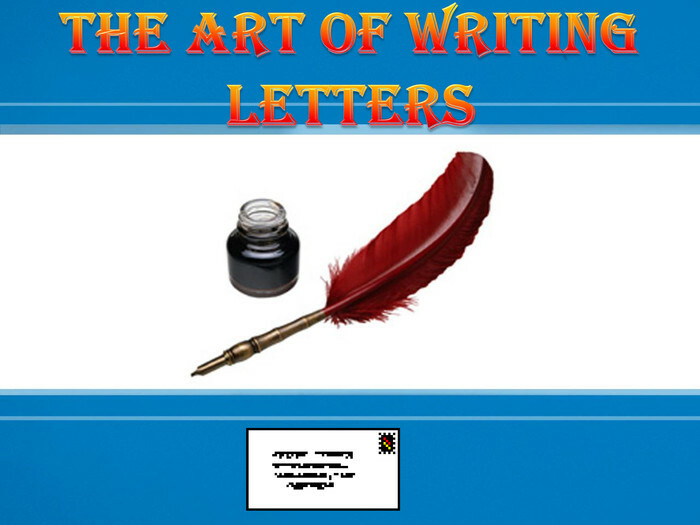 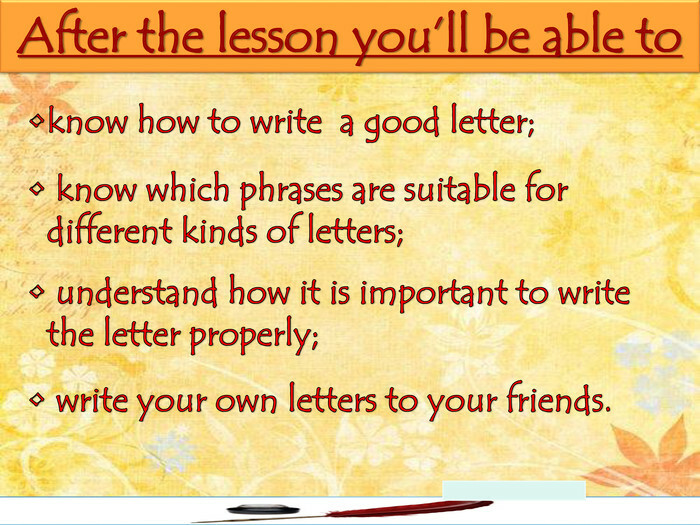 After the lesson you’ll be able toknow how to write a good letter; know which phrases are suitable for different kinds of letters; understand how it is important to write the letter properly; write your own letters to your friends. 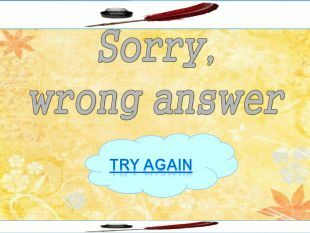 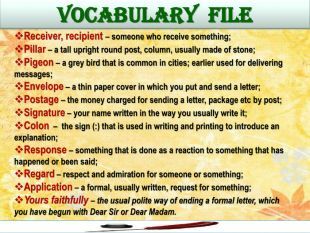 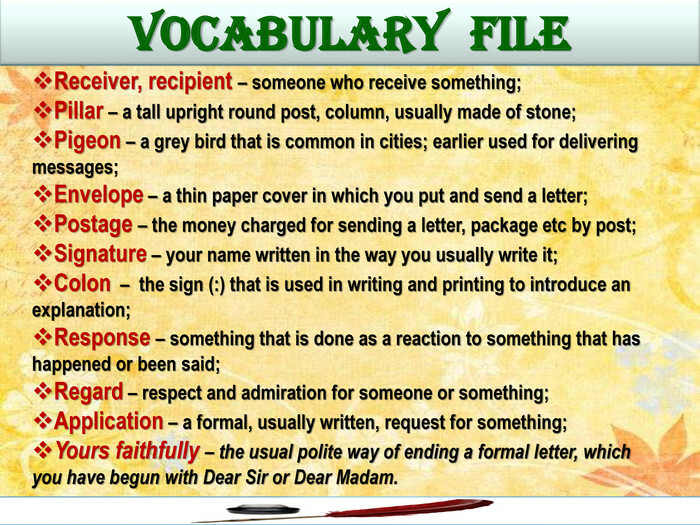 VOCABULARY FILEReceiver, recipient – someone who receive something;Pillar – a tall upright round post, column, usually made of stone;Pigeon – a grey bird that is common in cities; earlier used for delivering messages;Envelope – a thin paper cover in which you put and send a letter;Postage – the money charged for sending a letter, package etc by post;Signature – your name written in the way you usually write it;Colon – the sign (:) that is used in writing and printing to introduce an explanation;Response – something that is done as a reaction to something that has happened or been said;Regard – respect and admiration for someone or something;Application – a formal, usually written, request for something;Yours faithfully – the usual polite way of ending a formal letter, which you have begun with Dear Sir or Dear Madam. 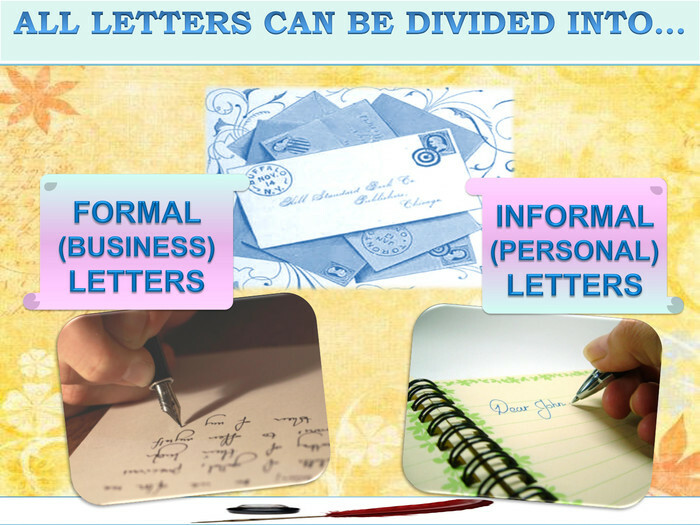 Formal letters are more complicated. 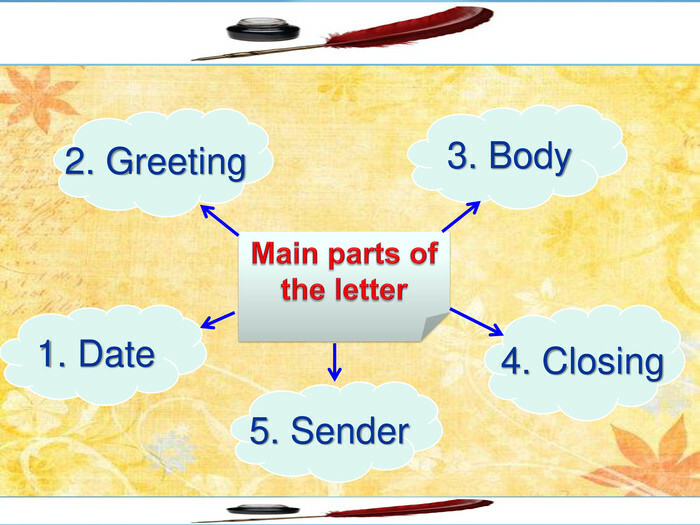 Besides the date you should write your address and the address of the receiver on the right. 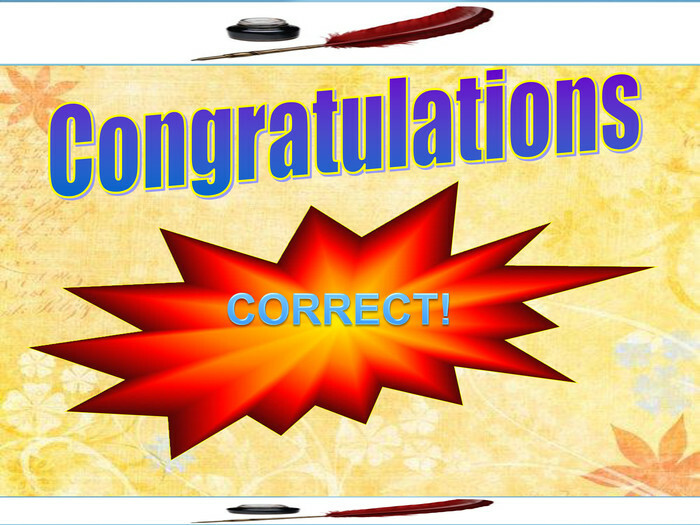 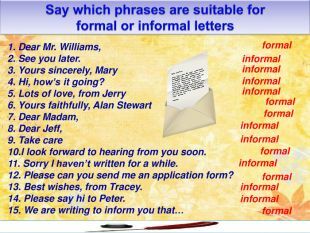 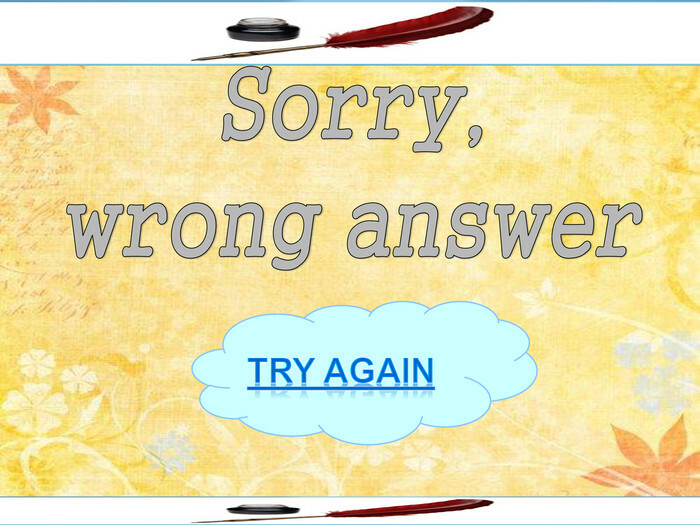 In greeting use Mr., Miss, Mrs., Madam, Dr., Sir before the receiver's last name and a colon instead of a comma, (e.g. 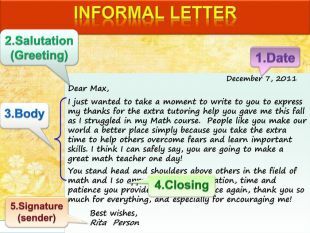 "Dear Mr. Johnson:“). 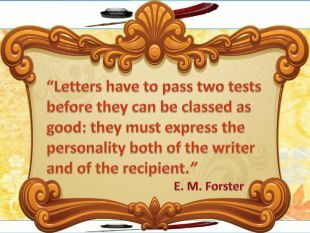 Write an opening paragraph. Be direct about why you are writing the letter. 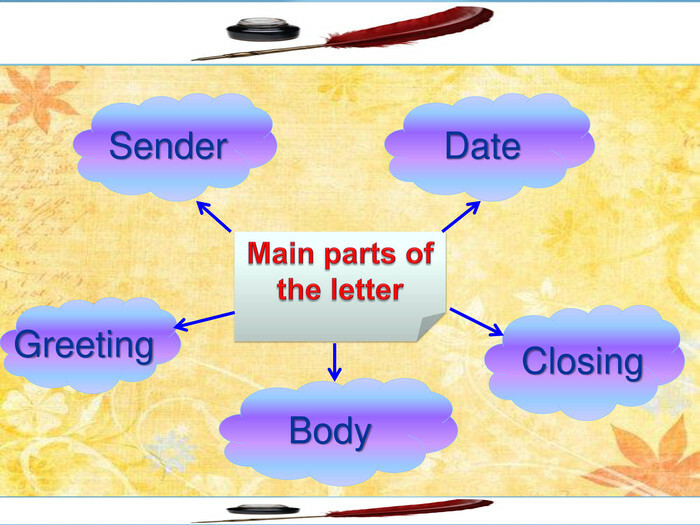 Construct the body of the letter. 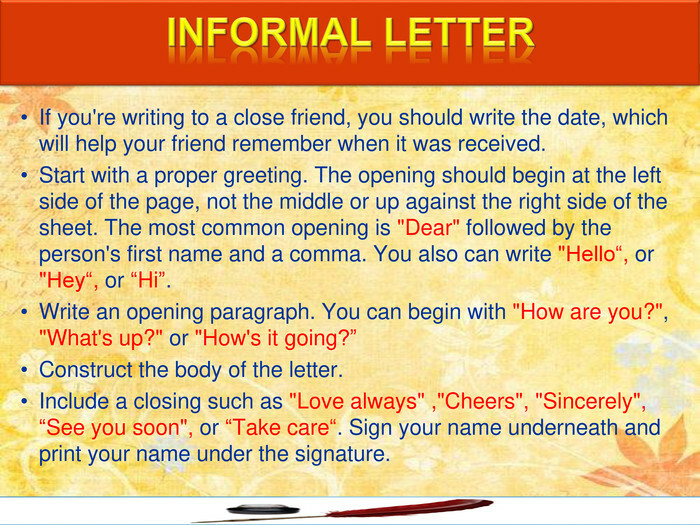 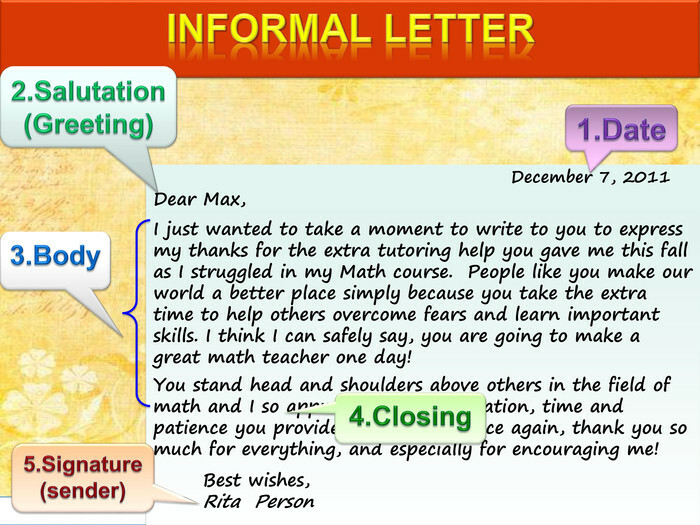 Use the closing paragraph to indicate the type of response you are seeking. 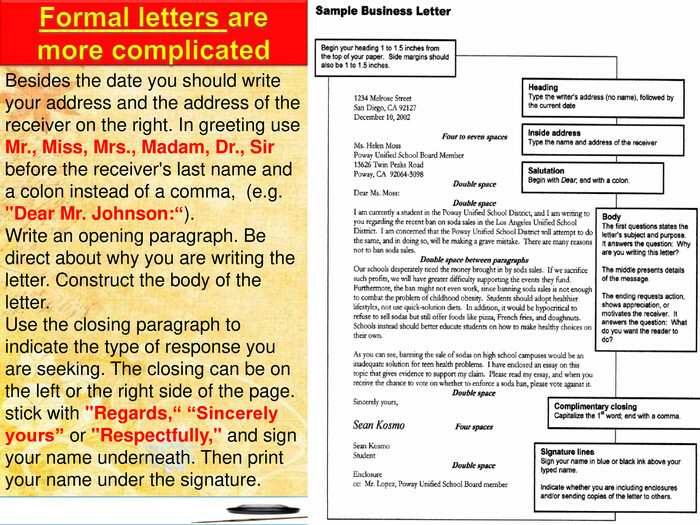 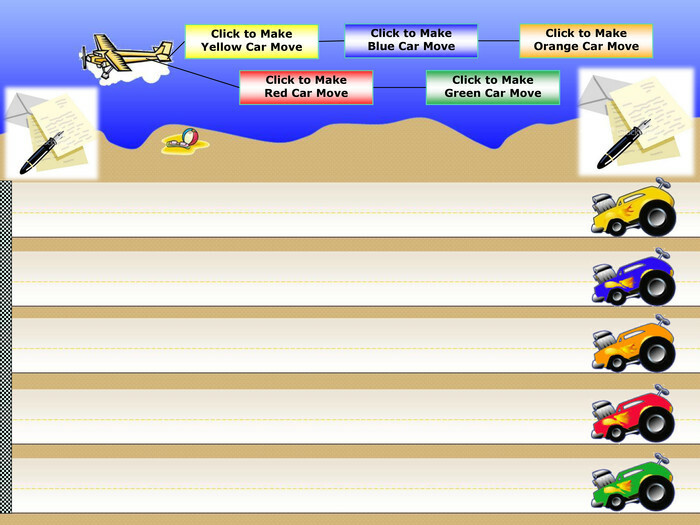 The closing can be on the left or the right side of the page. stick with "Regards,“ “Sincerely yours” or "Respectfully," and sign your name underneath. 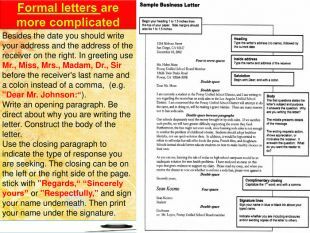 Then print your name under the signature. 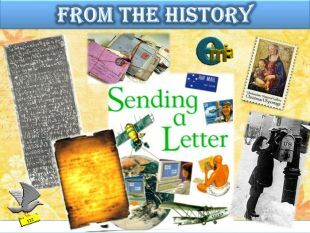 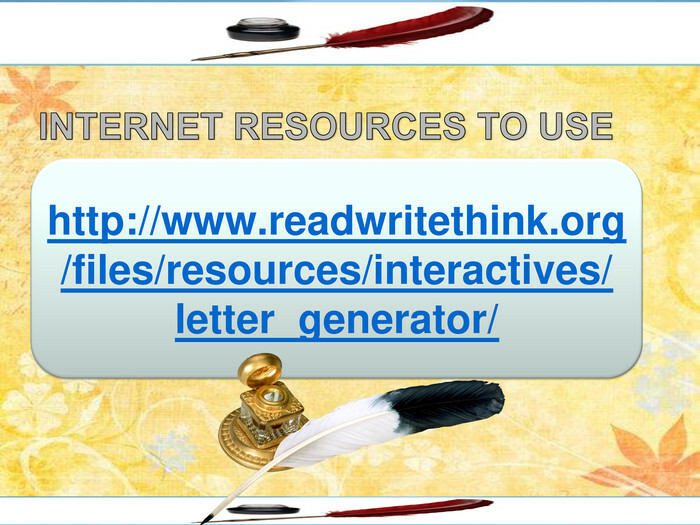 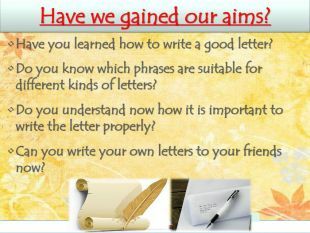 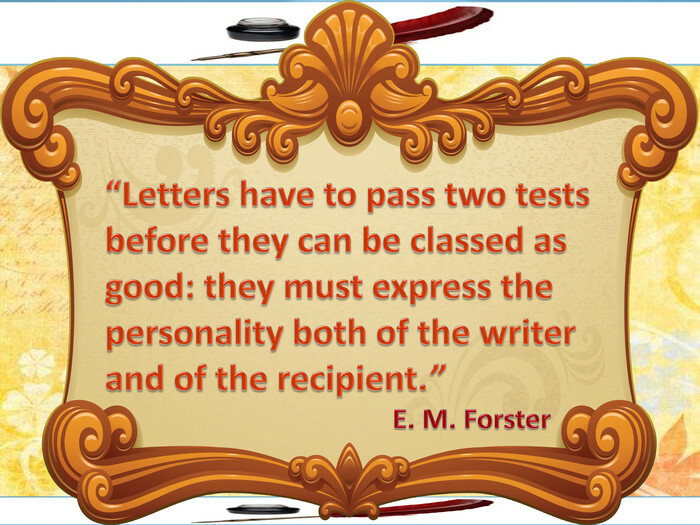 Have we gained our aims?Have you learned how to write a good letter? 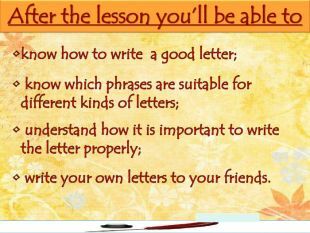 Do you know which phrases are suitable for different kinds of letters? 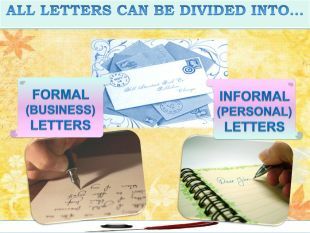 Do you understand now how it is important to write the letter properly? 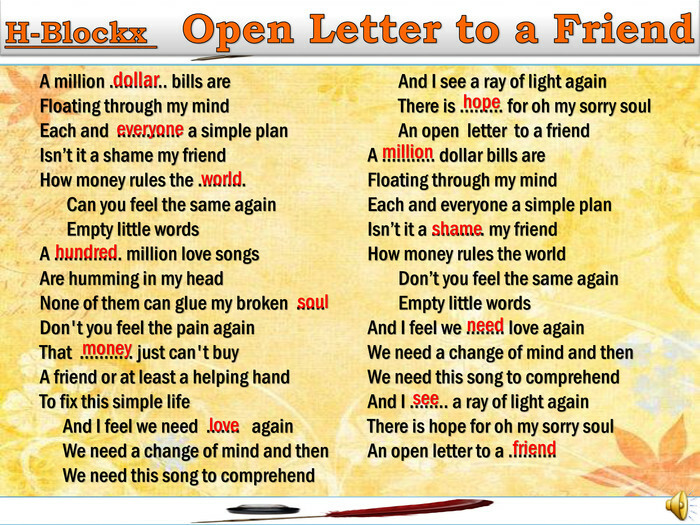 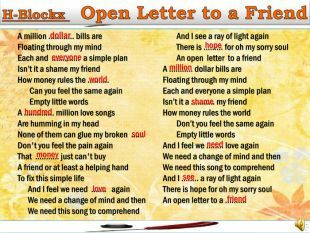 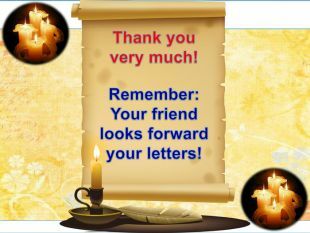 Can you write your own letters to your friends now? Thank you very much!Remember: Your friend looks forward your letters! 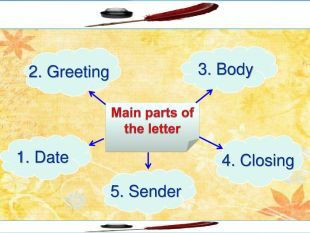 Презентація для учнів 8 класу з англійської мови, тема: "Музика. 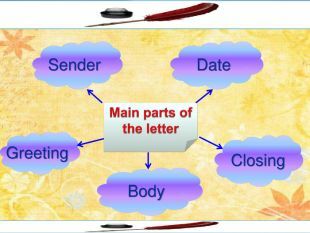 Музичні стилі"